Outsource Tasks, Not Responsibilities | Fulcrum ConsultingWorks Inc.
Outsourcing can be a valid business strategy, but retaining accountability is critical. Rebecca explains four behaviors that, when displayed to your customers, will strengthen confidence in you. 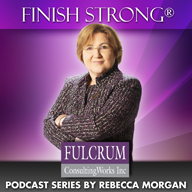 This entry was posted in Podcast Series: Finish Strong® and tagged outsourcing by Becky. Bookmark the permalink.